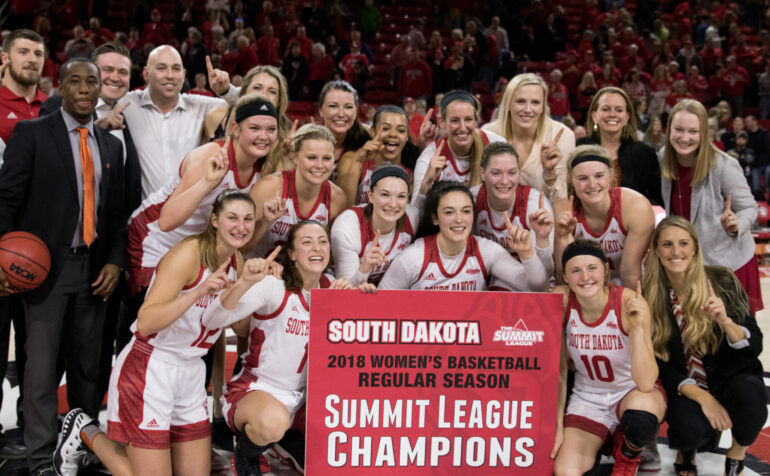 The USD’s women’s basketball team became just the second team to win the Summit League regular season undefeated Wednesday night. The women took on rival South Dakota State University in front of a crowd of more than 4,000 in the Sanford Coyote Sports Center and upset the Jackrabbits 80-75. The Coyotes now secure the top seed for the Summit League Championship, and their 18 wins are tied in the Summit League for most consecutive wins. USD is the only team to defeat SDSU during the regular season, according to GoYotes. Though SDSU had the lead multiple times, USD gathered multiple turnovers and defended until the end. Senior Kate Liveringhouse said the team focused a lot on defense during the fourth period. The first period saw back and forth shots between the Coyotes and Jackrabbits, though SDSU had better shot percentages (61 percent from the field and 66 from the three-point line). The score ended 18-20 in the first period. By the second period, the game picked up more speed and the Coyotes led 41-39, shooting around 50 percent from the paint and three-point line. The top scorer for the Coyotes was senior Jasmine Trimboli with 18, who also had five steals. Bradley scored 15 points, and Liveringhouse had 11. Lamb had the most assists with four. The Coyotes shot at 48 percent from the paint, 42 percent of threes and 88 percent of their free throws. Trimboli said though the team is undefeated in regular season play, they still have a bigger goal: the Summit League Tournament. Head coach Dawn Plitzuweit said she was proud of the team. The women (24-5 overall, 14-0 Summit League) have the top seed for the Summit League Championships. The games will take place in Sioux Falls March 3-6.